The program (final version) for PSJ-21 is now available.. <-- Updated! 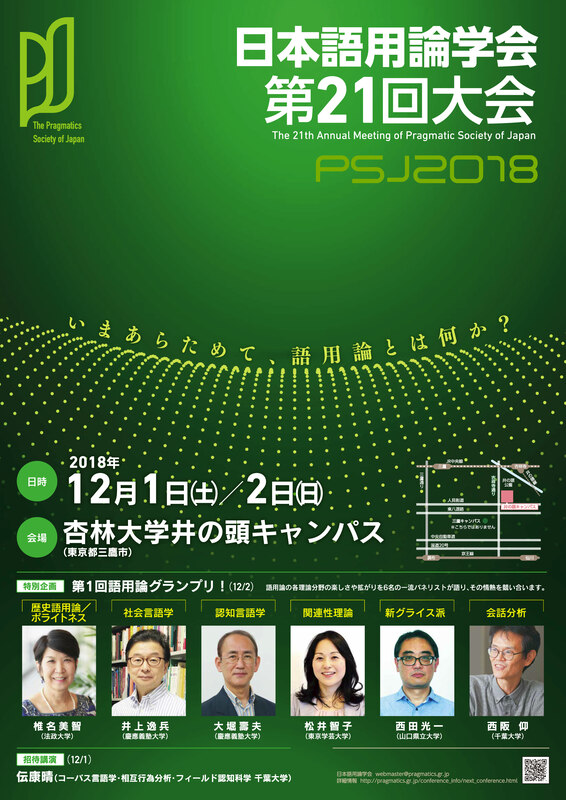 The Pragmatics Society of Japan invites abstracts for oral presentations, poster presentations, and workshops to be presented at the 21st annual conference. ※CAUTION! We are having a trouble that the PSJ members who have registered the "hotmail" account as an e-mail address cannot receive the confirmation mail. If you have registered "hotmail" account and you would submit papers for the annual conference, please re-register the e-mail address other than "hotmail". Abstracts must be submitted through Mypage. Notes: Abstracts that fail to meet any of the above-mentioned requirements may be automatically rejected. Consult 語用論研究 about the formats for the reference list. Submissions are limited to one individual and one joint abstract per author, or two joint abstracts per author. One time only per first author or workshop coordinator. Applications from the author or group including the author will automatically be rejected the following year in cases of duplicate submission. 1. “Publication” refers to any peer-reviewed academic archive such as conference presentation, journal article, or book. The program committee of the PSJ will determine the degree of overlap in technical content. 2. Unpublished B.A. / M.A / Doctoral theses are NOT considered “publications” in this context. 3. An abstract that has been rejected by another conference/journal review is not considered as a duplicate submission. It is expected that at least one author will attend and present the paper/poster at the conference. Authors who do not attend the conference without notice will be considered as a “no-show” and announced as such at the society HP. Applications from a no-show first author as well as all co-authors will automatically be rejected the following year. For questions, please contact us at : presentation -at- pragmatics.gr.jp (Hajime Nozawa). Inquiries regarding the submission must arrive by no later than July 21st, 2018.